DO YOU IGNITE THE POWER OF YOUR INTERNAL COMMUNITIES? A global manufacturing company with more than 19,000 employees and products merchandised by distributors in more than 50 countries worked with communities to strengthen its ability to work as ONE. The product management community struggled with collaboration, alignment, and involvement. To make things better, they brought in a new Head of the Community. His responsibility was to optimize and lead this global community in the right direction. It quickly became apparent to the new Head of the Community that it was not clear who was involved in the product management community, and what the extent was of their involvement. Innovisor was asked to get the new Head of the Product Management Community the full overview of involvement and collaboration in the community. These insights would then help him to plan the way forward. When we started collecting the responses from the target group, it quickly became clear that there was a lack of knowledge around involvement in the community. The Product Management Community was found to be twice the size of the initial scope of 400 employees. This is illustrated in the above image. We asked the input of 400 employees. These 400 employees were known by management as the ones involved in the Product Development Community. These are the dark blue dots. The red dots were those unknown to management as employees working around Product Management. This showed that the size of the community was much larger than anticipated, and that many of the unknown employees held central positions in the community. It was therefore decided to ask for the input of these unknown employees. By scrolling over the image below, you can see how the overall collaboration network looked in this community. The people who were sought out the most by their peers – the very central people in the network – were not spending much time working for the community. Data showed that these central people used less than 10% of their time on work related to Product Management. It was clearly a risk for the community that the very central people could only spend limited time on working for the community. On top of this risk, it showed that less than 50% of those involved in the community knew where to find relevant data and information. The new Head of the Community established a Center of Excellence structure to facilitate collaboration and best practices in the community. The core members of this Center of Excellence were identified based on the Organizational Network Analysis data. They were the people who were already spending much time on Product Management and were sought out by their peers as collaboration partners around Product Management. One of the primary tasks of this newly established Center of Excellence was to establish clarity around information sharing. This primary task was targetted to the supporting members of the community – focusing on how and when they should be involved. Organizational Network Analysis enables you to identify the real communities in your organization, so you know who you need to engage to succeed. It is a must-know lever for community managers. 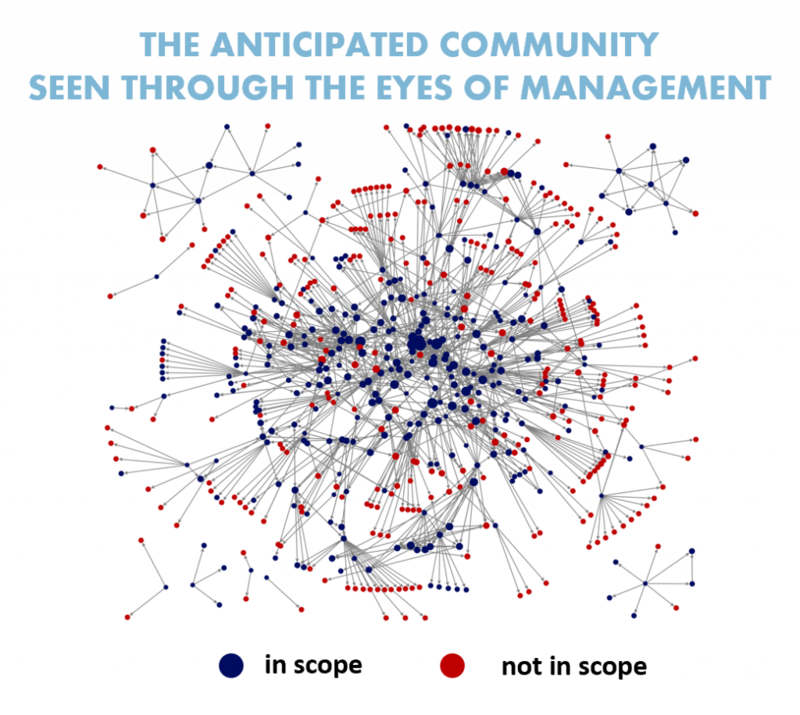 How can Organizational Network Analysis help you with your organizational communities?